So, you want to become a freelancer? Now is a great time to be freelancing! About 1 in 3 U.S. workers earn at least some of their income this way. If you’re not one of them, you’re missing out! But don’t just take my word for it. There are some well-known benefits that come with taking the freelance plunge — pros that are sure to make you want to get up and out of your cubicle so you too can enjoy the freedom and flexibility of freelancing. As a freelancer, you get to be your own boss. And I don’t know about you, but being in charge of the show is infinitely better than being micromanaged any day of the week. Amiright? And, if those weren’t enough, most freelancers get to work from home or Starbucks or Sri Lanka or wherever, really, as long as there’s Internet. Of course, you can freelance in person too but why bother when you can freelance from a location of your choosing? Have I convinced you yet of the awesomeness that happens once you become a freelancer? If so, you’re probably ready to take the next step — getting started. Like cleaning out that drawer in your kitchen with random buttons, chip clips, coupons, and unclaimed chargers, the deeper you get, the more overwhelmed you may feel. So, instead of diving in, you close the drawer — “for another day,” you tell yourself (sorry, metaphors aren’t my strong suit). And while the desire is there, that day never actually comes! But that’s the easy way out! I’m not gonna lie, launching a freelance business is W-O-R-K. Yes, you may be in yoga pants or PJs most days once you become a freelancer, but that doesn’t mean you’ll be endlessly snoozing or stuck in child’s pose. Remember, as the boss lady (or gent), your success is entirely dependent on you. The more you put into it, the more you’ll get out of it. Think you’ve got what it takes? Ready to find work freedom and become a freelancer? That’s the spirit! Take a deep breath ’cause here we go. What Skill Will You Sell? So, we know how awesome life can be when you become a freelancer but we haven’t really talked about what it really means to be a freelancer. In a nutshell, you’ll be selling your services. That’s it. To do this, you’ll need to find a skill that you can market and sell to others. You’re wrong. You do have valuable skills! And people will buy from you. You will either find a skill that you know how to do that a lot of other people don’t OR market yourself as a time-saving superhuman who’ll help people free up time to do more important things. We know a lot. I can still remember the pythagorean theorem from high school. Why? I don’t know. But it’s still there tucked away in the depths of my brain with the theme song to The Flintstones and all the state capitals. You probably know a lot too and can do some amazing things — like pull a pen out of your purse without looking and recall your home phone number from when you were a kid. And while super cool and pretty impressive respectively, these aren’t exactly the skills you’ll want to advertise when you become a freelancer. Instead, you’ll want to promote those things you know which are in demand and highlight your abilities to help people save a ton of time in life. But before you start selling these skills, you’ve got to figure out what you know that’ll sell. Hard skills are those that can be measured. If you can take a test to demonstrate your knowledge or otherwise ‘prove’ your competency, it’s likely a hard skill. While these are valuable skills in their own right, soft skills just can’t be as easily proven. I mean, when’s the last time you saw an interpersonal communication contest or took a test to measure your dependability? That’s why your hard skills are likely going to be the ones that you sell. These are the obvious skills that people need in order to solve a problem. When a blogger needs website help, they hire a freelancer who knows how to code (hard skill). When a small business owner needs help balancing their books, they hire a freelancer with Excel experience (hard skill). When a company decides to increase their online presence, they hire a freelancer with social media marketing know how (hard skill). But just because you won’t be outright selling your soft skills, doesn’t mean they’re not important! Let’s pretend you know how to code. That’s great! It is an in-demand hard skill. But if you know how to code and happen to be detail oriented, even better. You’ll draw people in with your hard skills and sell them on you, as a freelancer, with your soft skills. Let’s say there are two graphic designers who can create awesome logos. Both have equally impressive portfolios showcasing their work. But one is deadline driven and a great communicator. The other doesn’t mention anything other than their ability to create logos. Probably the one you know will get your work done on time and will communicate with you throughout the process! Remember, your hard skills bring clients to your door, the soft skills sell them on you as a freelancer! Your turn! 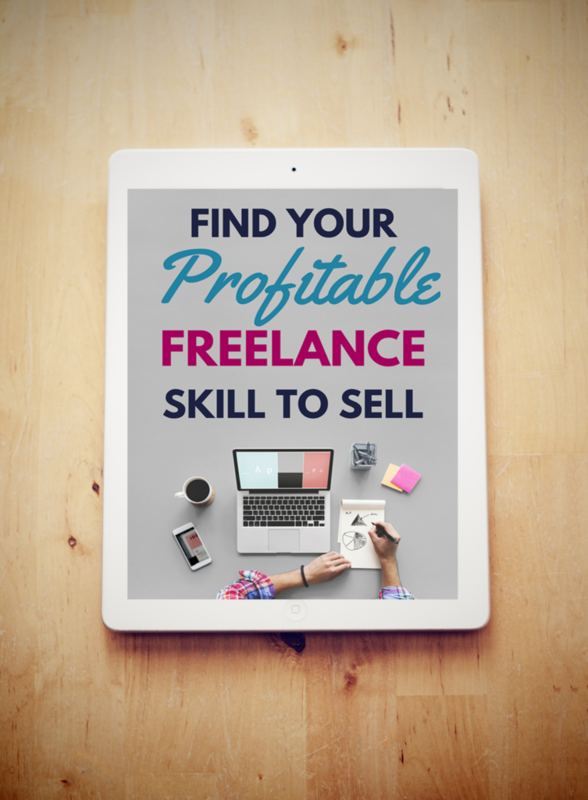 Grab your free copy of my e-booklet, Find Your Profitable Freelance Skill to Sell (over there to the right). I want you to really think about what you know in terms of hard skills (your bread and butter) and soft skills (likability factor). Then cross-reference it with the included in-demand freelance skills list in the booklet. Keep in mind, this booklet does not contain an exhaustive list of hard skills that sell. But it does include some of the most in demand, often-sought skills that clients are constantly asking for from freelancers, like you! 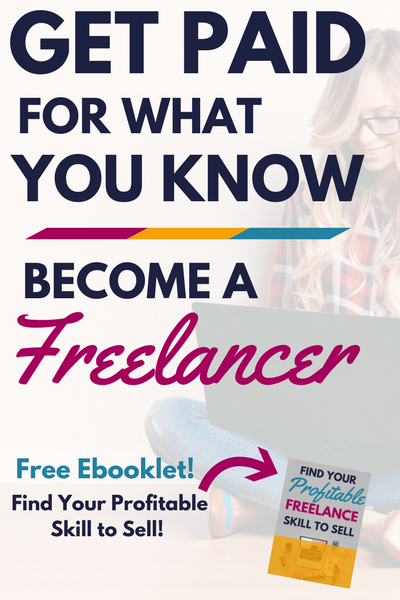 Use it as your guide as you take the first step to become a freelancer. More than anything, I want to show you that you do have what it takes to freelance! And, more importantly, help you see that you have at least one marketable skill that you can package into a service for sale. How’d you do? I’ll bet you came up with a pretty impressive list of hard skills and soft skills AND were able to match them with at least one in-demand service offering. Now that you know you have the hard skills to attract clients and the soft skills to shine as a freelancer, what do you say you start selling? First things first, check out my guide to setting up your freelance website. Your own website is the perfect platform to advertise your freelance status and gets you one step closer to realizing your own work from home happiness! That’s okay. Sometimes we all need an extra helping hand now and again. For a quick question, leave it in the comments below. Or you can tweet it out to me @AshleeWrites. P.S. This post contains affiliate links. What are they and how do I use them? Read my disclosure statement to learn more. The post Become a Freelancer: How to Find Your Skill that Sells appeared first on Work from Home Happiness.